I'm going to be using this thread to see how many people would be up for a game like this. If you're interested and think you'd participate if I release this, let me know by posting here, as a lot of the aspects in this game depend on how many people would be joining it. So if numbers are high or low, it would give me an insight as to how it should be designed (if there are enough people for a release). It's been a while since we've last had a Pikachu Survivor Game, so I'm thinking doing something along those lines would be fun. And then with Pokémon Let's Go Pikachu and Eevee coming along in November, I thought hey, doing a variant in light of those would be fun. It would be a fun and silly way to celebrate the launch of these games a few months early. The basic premise remains the same as last time and there's multiple ways to play. As before, everyone starts off human. In the past, it was just with Pikachu, so as the game goes along, essentially every player save for one gets turned into a Pikachu one way or another (some multiple times if they used a Blessed Cure item to return to human). The other zany element of it was that if you became a Pikachu, your avatar and banner got swapped out for a Pikachu version and taking them off meant you had to forfeit your place in the game (thankfully this didn't happen too often). The "classic" way to win is to be the last human standing. To help with that, players answer trivia question challenges for items to protect themselves and weapons to attack other players and increase their chances of becoming a Pikachu. This time around, I'm throwing Eevee into the mix as well. So you start human, but you could end up either as Pikachu OR Eevee this time! So this presents a unique scenario! The Pikachu side will be trying to get more people to become a Pikachu while the Eevee side will be trying to get more people to become an Eevee. A special type of victory goes to the side that has more members caught in its clutches at the end of the game! It becomes a Pokémon team competition and the remaining humans are caught in the middle of the mayhem! So if you become a Pikachu or an Eevee, do you join the cause of your fellow Pokémon brethren or just try to get back to being human again? It's your choice! 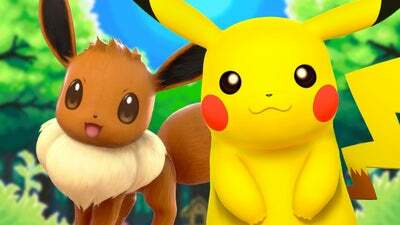 This time around, the weapons and attack items that the Pikachu players used before are now available to both the Pikachu side and the Eevee side. So if you're a Pikachu and you slam a human player with a weapon you collected from a Pokémon Trivia Challenge, you afflict your target with chances or effects to get them to become another Pikachu. And same thing with the Eevee side. Meanwhile, what used to be solely Pikachu Rolls (triggered once a day to see who would be the next Pikachu) will now alternate with Pikachu and Eevee rolls. And yep, expect plenty of Pikachu and Eevee banner and avatar combos. So if that interests you and you think you'd participate, post and let me know! Didn't even need to read this to know I'd be excited for a new (and new version of) Pikachu Survivor Game. All in it's new Let's Go style too! It's kinda what led me here in the first place. So kinda has that awesome and special feeling to it. Now it's got even more unique elements to it too! I just wish there were a way to promote THIS out there and bring more people to PXR. It gauged my interest way back and I'm sure it'd do the same for many others. Especially with the Let's Go games right around the corner. Think we need a poll here or just gonna roll with comments? Sure, no prob, dude! Yeah, I kind of wish there was a way to promote it on the outside as well, but I think most other sites would think that's just advertising and wouldn't want that done. Would we provide our own graphics or would they be provided for us? LET ME BE THE FIRST SECOND THIRD PERSON TO SAY THAT THIS IS A GENIUS IDEA AND I SHALL PARTICIPATE WITHOUT HESITATION! Finally, yes! Glad it's not being delayed any longer! Glad to see people are interested, but to make it work, I really need at least ten people. So if there's anyone out there that's reading this but unsure, a lot of this depends on you! Trust me, it'll be fun and we've never had a dull PSG in the past! It's honestly really easy to learn how to play, also. Plus I don't think anyone has ever joined the PSG version of this and regretted it. And even if you get transformed into a Pikachu or Eevee, you get a free banner and ava set out of the deal. I'll try to make them extra nice! But yeah, I've tried to think of ways it could be done with less than ten people, but it just can't. Not without stripping a lot of items out (fewer people makes it end too quickly and stripping the more zanier items to avoid having them be too overpowered makes it not as much fun). So really, the more people that join, the more fun it will be. So yeah, the big reason why I need to run an interest check is because if we don't get at least ten peeps, we're in trouble. And if cool things happen and we get at least ten, it would help me gauge how many banner and avatar sets I will need to prepare.